We get sick, mentally and physically, without the emotional and physical security that flows from positive connections to other human beings. “The incident in Atlanta in which emotional connection averted another school tragedy exemplifies a main message in Forging Healthy Connections,” said Trevor Crow, LMFT about the way Antionette Tuff, a bookkeeper at McNair Discovery Learning Academy, convinced a gunman to back down. 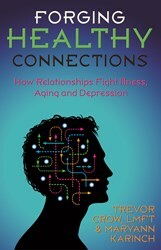 Forging Healthy Connections (New Horizon Press, November 2012) is an upcoming book by Crow and co-author Maryann Karinch that features science and stories that illuminate why human beings require relationships to be healthy—physically, as well as in terms of social functioning. The book also examines how people biologically and neurologically combat serious illness with the help of strong relationships. In Forging Healthy Connections, Crow and Karinch explore strategies for setting up and maintaining secure personal connections in our professional and personal lives. They show how to build a healthy network of connections so we can create an emotional safe haven that directly and positively impacts our health. They examine why so many of us fail or lose relationships as we age, discuss the types of relationships we might be lacking, explore trust issues, explain the reciprocal effect and, most importantly, describe how to establish and practice empathy with friends, family and business associates. Trevor Crow, LMFT, hosts "Keeping Connected," a weekly radio show about relationships, and is a licensed marriage and family therapist. Crow has a Masters in Marriage and Family Therapy from Fairfield University, Connecticut and also holds an MBA from Harvard University and a BS from Parsons the New School of Design. She practices and resides in Southport, Connecticut. Maryann Karinch is the author of eighteen books, most of which focus on human behavior, and is the founder of The Rudy Agency, a literary agency specializing in non-fiction. She holds bachelors and masters degrees from The Catholic University of America in Washington, DC and is a certified personal trainer. She lives in Estes Park, Colorado.